Once again we are graced with the presence of some excellent equipment and I had the opportunity to spend some intimate time, yes it may have been a little emotional as well, with a full set of Vulcan Competition plates. They arrived a few weeks ago on a small palette in properly packaged and labeled boxes. Much to the dismay of the delivery driver who looked very displeased he had to move 140kg’s of weight for a guy opening up a door on gym shorts and house slippers. Just for a quick reality check. The all honest 30,000ft view is that these are plates. So this may not be the most in-depth detail review as I am literally talking about a metal/plastic circles. Some are lighter, some are heavier. We pick them up, we put them down. Now there are some interesting components to these Vulcan plates that make them stand out a bit more on their own but also in my experience with them, they have performed extremely well and I do prefer them over other plates I have used at this point. How do they fit on different bars? Weights are guaranteed to within 10 grams of stated weight. 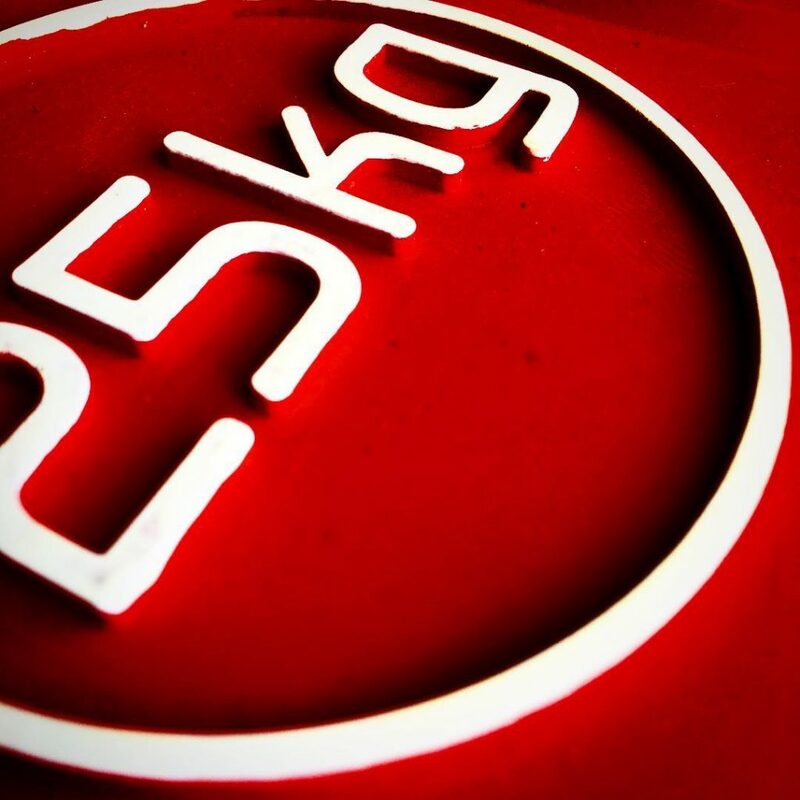 All plates are weighed before leaving our warehouse on scales accurate within 1 gram. Thinner profile than most competition bumper plates allows more plates on the bar. Raised lettering is coated with indelible ink that will not come off or fade like most competition bumper plates. Discs are glass bead blasted to provide great aesthetic look after multiple uses. Rubber sits approximately 1.25 mm above disc to ensure super tight fit and minimal metal to metal contact between bumper plates. The steel discs of the Vulcan Absolute Bumper Plate are guaranteed not to depart from the plate or spin within the plate for the duration of the warranty. 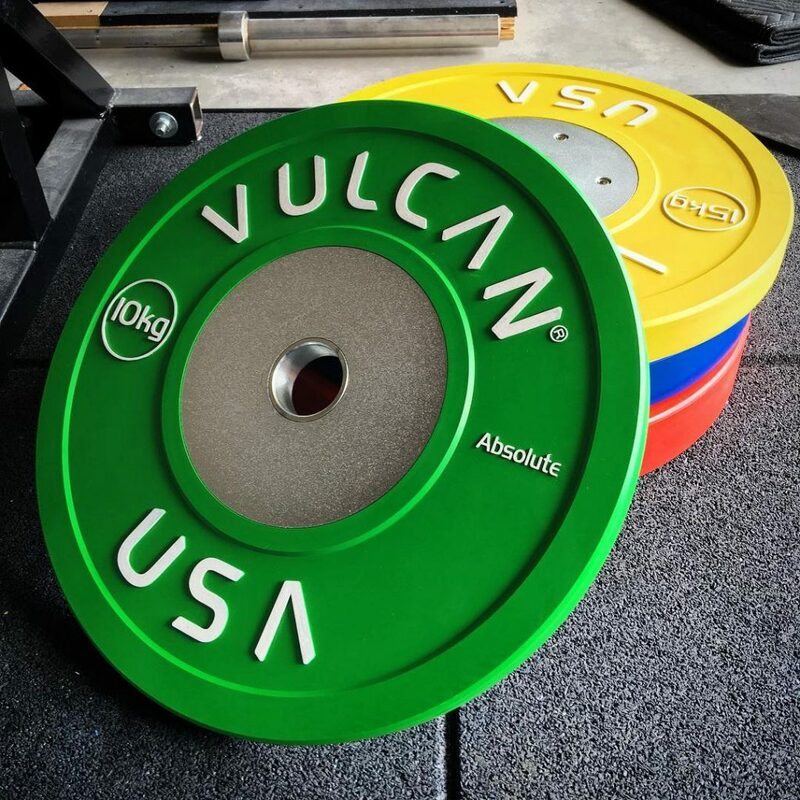 In comparison to the Pendlay/Rogue plates we are all pretty much familiar with, the Vulcan Comp plates have a really low bounce and are not that loud at all when dropped on the platform. This was a pleasant surprise indeed as I have been using the DHS rubber plates this past year and they bounce like a basketball. 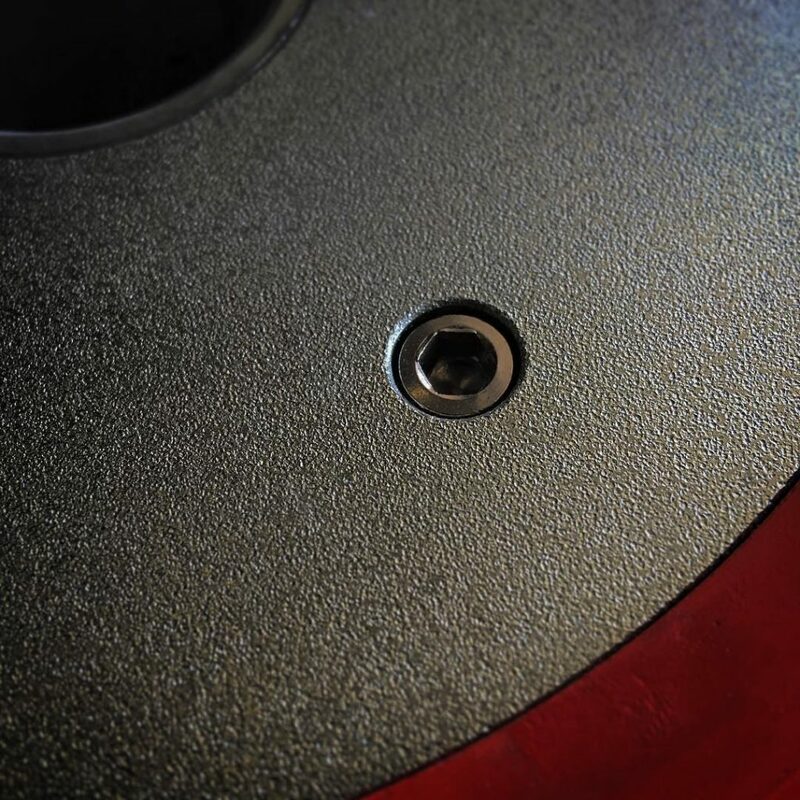 The reason for the close to “dead drop” plate with low sound is due to the rubber compound used in the plates as well as the construction of the plates ensure the metal discs sit will beneath the rubber. As stated, Vulcan Absolute Competition Bumper Plate Sets are spot tested and mechanically drop tested 10,000 times and all Vulcan Elite Bumper are manufactured in accordance with IWF specifications. 135, 140, 145 dropping on a plywood rubber mat platform. Editor’s Note: That video is gone from youtube – See the below video with another drop test. The metal discs look and feel absolutely solid. Just a whole bunch of awesome with this really nice texture to them that adds just a little bit of flair and style. The steel discs of the Vulcan Absolute Bumper Plate are guaranteed not to depart from the plate or spin within the plate for the duration of the warranty. I don’t know about you guys but right now I am dealing with a few Pendlay plates that the center discs are broken and a DHS plate where the rubber is cracking. Seeing Vulcan broadcast this statement is a strong stance of them standing behind their product. Warranty information listed at the bottom for reference. All Vulcan Elite Bumper are manufactured in accordance with IWF specifications. 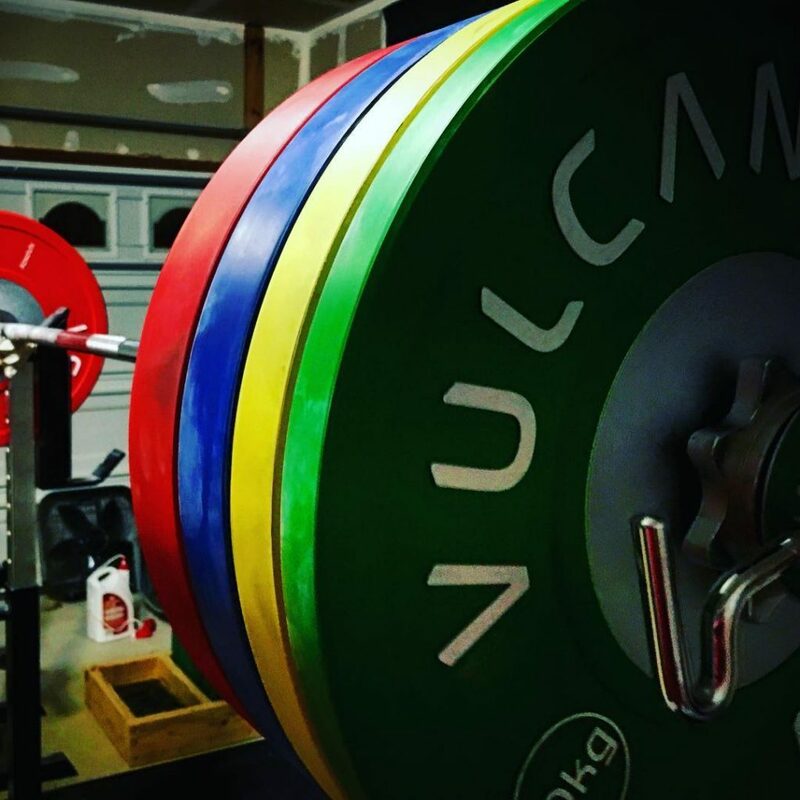 They can only guarantee that Vulcan Absolute Bumpers will fit properly on Vulcan Barbells and other barbells made to IWF specifications. We cannot guarantee the fit on lower end bars that have not been manufactured with strict tolerances for the collar diameter. I have tried them all on DHS, Eleiko, Pendlay, and Uesaka bars and everything fit nice without a problem. One detail I thought was a very nice one to put in and I’m sure it added to the manufacturing costs of the bumpers is the raised lettering. If you look closely, you can see all printed information on the number is actually raised. Along with the raised lettering, the ink used is indelible and will not wear off. What is even cooler is that the raised lettering is accounted for in the actual weight of the bumper. You can expect each bumper to be within 10 grams of their expected weight without fault. One implication that most wouldn’t recognize is that by having raised lettering, that means that Vulcan truly owns their molds for these plates and they are only used for Vulcan plates. In comparison, Pendlay/Rogue buy their plates from a manufacturer that has one set of molds reused to mass produce their equipment orders. In this situation, they do not control the quality or preciseness of these molds. With Vulcan owning their molds, this does ensure a higher level of quality, consistency, and keeps the control in Vulcan’s hands. eg. If the factory fails for Vulcan, they can take the molds and go find a better one that will serve them and us better. 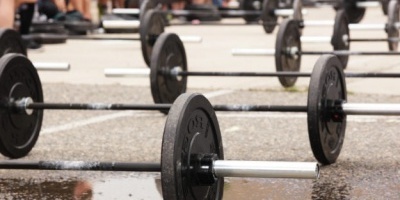 Over time my personal opinion of training equipment has evolved. Before, I was more cost conscience with the opinion of weight is weight. But seeing friends with broken bars, plates that are off weight, a metal center piece that is broken after a few months, and bolts that need Loctite constantly. I think it is worth every penny to buy the better equipment up front. If this is for you or your home gym, take the time and purchase the equipment you desire as this is most likely a 10+ year investment. So yes, make your choices wisely as this is a longer term investment but there are some great choices out there these days. Of course there are the usual suspects, Eleiko, Werksan, etc. but its great to see Vulcan step up to the plate with some quality gear as well. * 5 Year warranty. Warranty covers steel discs departing from or rotating within the plate or plates breaking. Absolute Competition Plates should not be used outdoors, on bare concrete floors, or dropped on rubber flooring less than 3/8″ thickness. Intentional misuse, neglect or abuse will void warranty. Editor’s Note: The Vulcan comp bumpers are available direct from Vulcan Strength as individual plates or in discounted sets. A late starter to the sport of Weightlifting, at age 30 it was time to get healthy again and into what is now his new addiction. Like most others out there, he has a regular job so his participation in Weightlifting is out of passion and always pursuing progression. I am looking forward to competing in Masters in 2017/2018 and hopefully helping the continued growth of this sport.